It’s no secret that fans of The Mortal Instruments are a bit anxious — and terrified to say the absolute least — for the forthcoming release of City of Heavenly Fire, coming May 27, 2014. 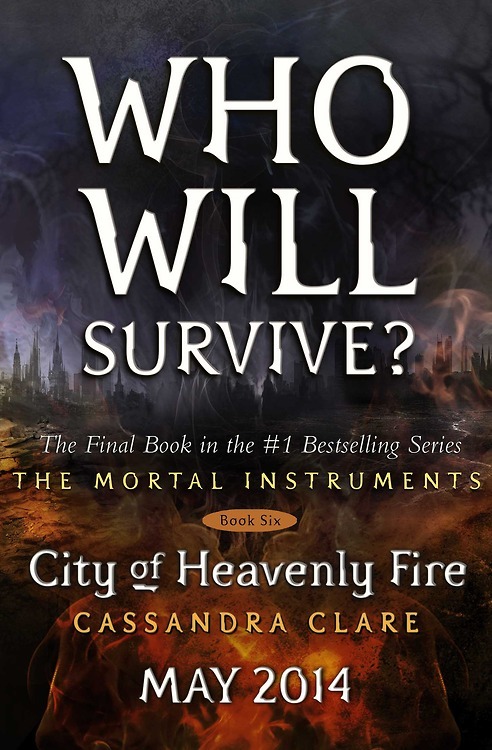 That sheer terror and anxiety has come from the mention that six characters we know by name will die in City of Heavenly Fire, not to mention that the placeholder cover poses the question, “Who will survive?” Not exactly reassuring. City of Heavenly Fire is easily one of — if not the most — anticipated books of 2014. Fans are eager for any news or tease regarding the final book. When we spoke with Clare last week about the upcoming Blu-ray and DVD release of The Mortal Instruments: City of Bones, we just had to ask about City of Heavenly Fire. Clare teased what we can expect from the last Mortal Instruments book. Clare said she’s having fun writing her next Shadowhunter series, The Dark Artifices, the first of which — Lady Midnight — is set for release in March 2015. Clare was actually writing City of Heavenly Fire while on the set of The Mortal Instruments: City of Bones. She said that revisiting her characters as they were in the first book actually helped with wrapping their stories up. There were even times on set when she was writing that she pictured the actors as the characters in her head. Though we don’t know who is on the cover of City of Heavenly Fire, Clare has seen the final cover and she likes it. As for when the cover will be unveiled, Clare said it should be January. But don’t hold her to that. Clare is very excited about the surprise that comes on the cover jacket, which is a sort-of pull-out mini poster featuring fan-favorite characters fans have always wanted to see on the Mortal Instruments covers. Clare isn’t sure when the full pull-out poster with the characters will be revealed as Simon & Schuster might want to do that at a different time. They’re still working on that right now. this book series has been one of the best i have ever read im so excited for the last one. i already read the infernal devices which was great and made me cry a lot, im thrilled for the dark artifices. I can’t decide whether I’m excited or scared for this book. But I’m glad she finally finished it. Right now I guess I’m more excited. Some people really didn’t like the direction of COFA & COLS but I liked the books. They are good books but I must warn you they are very aggravating at the same time. After City of Glass you think Clary & Jace will have the freedom to explore their relationship since they are not brother & sister, well that isn’t the case. She teases you with passionate scenes mixed here & there with them but from the very start of COFA there is already something going on with Jace that effects their relationship and that’s what makes COFA & COLS so aggravating. That’s why for me if Jace & Clary don’t end up together in COHF then the total series will be a total waste since they fight so hard for their love & to be together in COFA & COLS. the books are fantastic after cityof glass. glass was my favourite one with the happiest ending out of all five of the books. i mustsay that you will be upset in city of fallen angels becuase there s separations but they are reunited soon after that book in city of lost souls. you really should read all the books, i was sad that they got separated but the books never stopped encouaging me to read on. No cause you want to get to a point where Jace & Clary are totally together without holding back. That’s why if they don’t end up together in COHF it would destroy the books for me. I have read City of Bones and City of Ashes but I am reading all of the other books than the three Clockworks than I will be finished for City of Heavenly Fire. In all honesty, I only want to know one thing that will calm me down immensely. The answer to whether Alec and Magnus both live. In my mind, I want them back together but all us fans know that’s highly unlikely. I just want them to live…. Ok I totally agree I want the same thing to happen. If one of them dies in the end I’ll be crying for sure. i am almost certain that magnus is going to die, as much as itpains e to say it. my friend seems to think tht jace is going to die, but that would be a very bad ending, but if she kills off the fan favourite then it is just a very sad ending. i would hate for magnus to die but if one of the main characters had to die it would be him. Me too! I would hate and i really mean hate the end, if Magnus or Alec are going to die! I dont think its unlikely that they will come back together again (Because the Spoilers of Cassie Show show that they still take care of each other and there was also a Spoilerpic, on wich they were kissing), I am more worried about the Situation that one of them will die to save the other! In my Oppinion, that would be the most sadest and badest end, could happen! Like everyone else, I am scared out of my mind for the ending, yet there is also a bittersweet feeling to all of this. I have a feeling that whatever happens in the end, who lives and who dies, it will be sad but happy. Just like in CP2. I’m excited and anxious to read City of Heavenly Fire. Holy crap how did I miss this”six characters we know by name will die in City of Heavenly Fire”..I knew there was atleast one shadowhunter that would die but 6? SIX CHARACTERS??? Ok now I am seriously scared!!!!! OMG….!!!!! I can’t live if Jace, Magnus, Alec or Clary die…. I just can’t!! I’m terrified and scared by the hell out of my mind about the finaly book!! I am looking at these website every day just hoping to find out no one is dying and now comes this?! We know Sebastion is gonna die (There’s one)I think it’d be sweet if maybe Jem died and then Tessa gives her life to save the others because she feels like she has lived to long. (That’s 3) and then Magnus or Alec will die (There’s four(But also it’d be acceptable if the death was like Tessa’s and Magnus loses Alec so he gives his life not wanting to live anymore)) and then Simon is probably gonna die cause he is my favorite character and my favorite character always dies. (Five) and then Perhaps Clary (Doubt it) or Jace or perhaps Helen Blackthorn, or luke cuz he is always sticking his neck. I have no problem with Sebastian dying but the others I do.Clary or Jace dies that will just ruin it for me I couldn’t take it if they didn’t end up togther.I am afraid Simon is one hat will die but I really don’t want him to. I think Sebastian is def one. Maybe Maureen and Rapheal. I think Magnus will die and Alec will feel bad for wanting him to be mortal. One of the wolves (Jordan or Mia) will die. I could see Marse dying. Did Amatis die during the battle? She could be a possibility too. Surely she won’t kill Jace or Clary. It`s a sad ending i can see it! And im retty sure that would be Jace who is gonna die! I can’t bear to think of Alec or Magnus dying.please Cassie don’t let it be them. Ok so heres wat I think. . . . I don’t think people should worry that a total of 6 characters will die. Im sure some might end up really dead but remember she has basically killed off Jace twice & Simon once & they both ended up not dying. here r my six characters that i think will die. for maureen dying i think that maybe raphale will die and maureen will become official vampire leader of newyork. and maybe alec would die instea of magnus. im more sure that it will be magnus but alec is becoming very possible death. with all the parabatie stuff happening, i am thinking that he could die leaving Jace parabatieless. I think that the following will DIE…. and I can’t think of a six right now but I think that sice the snippet I saw with Sebastian saying “I killed you boyfriend just thought you should know” I think Sebastian Killed Magnus and then Says that to Alec and Alec kills him then runs to Magnus…..